The block that so scrappy had used the tri recs ruler to make and I don't have it so I switched it with this on, interlocked squares. I really like the way this one came out. Today I'm linking up with Patchwork Times for Design Wall Monday, Cooking Up Quilts for Main Crush Monday, Bits n Bobs for Design Board Monday, and BOM's Away at What A Hoot Quilts. On Tuesday, I'm linking up with Quilt Story for Fabric Tuesday, with Freemotion by the River for Linky Tuesday, with Blossom Heart Quilts for Sew Cute Tuesday, and with Mrs. Sew and Sow for Scraptastic Tuesday. Then Wednesday with WIP Wednesday at Freshly Pieced and at Sew Fresh Quilts for Let's Bee Social. Don't forget to join me next Tuesday to link up your leader/ender projects! What a super pretty star block! Who would have thought browns could look so very nice in a star? This is a great block. Great substitution for the one Angela shared. Thanks for linking up with Oh Scrap! Love the orange row and good substitution although you could draw an equilateral triangle with a pair of compasses and just square it up with the background fabric - you don't need the trirec ruler! Thanks for linking up to #scraptastictuesday! Beautiful star block. The colors are saying fall to me which is my favorite season. A few weeks ago I made a block very similar to this, minus the small centre square you have, thought I'd invented a new one... apparently not! I love stars so will have to give this twist a try! 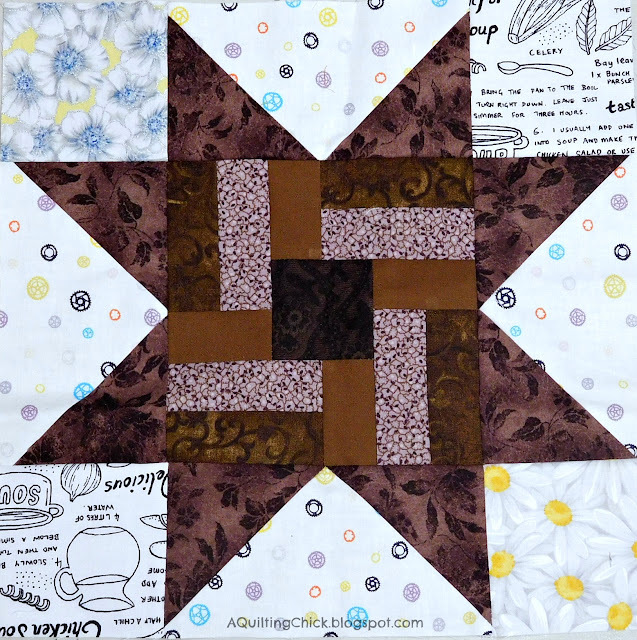 Oh, I really like your center interlocking strips and squares. Very interesting design. Oh I love all your blocks! The browns are really appealing! Your orange blocks look great. Love the chocolate browns in this month's block. I'm looking forward to seeing everyone's sampler come together. I'm going to be sorry I didn't make this one. Scrappy quilts are my favourite and your blocks are looking very pretty. Those are adorable pups, I'm sure you'll both be able to enjoy them on the couch! Dog Gone Cute Blog Hop - a Finish and a Giveaway!